Pretty funny but damn, this takes balls, and a complete lack of conscience or regard for co-workers. A developer at Verizon was busted for outsourcing his entire job to China (he FedEx’d his VPN key fob to a Chinese company who then used it to log in as him). While someone in China was writing his code, he sat at his desk and surfed all day. You can read the story at Huffington Post. I have copied and pasted it below in the event the link dies. Below that is the actual case study from Verizon (from which HuffPost, et al, gathered their material for their write-ups). They wrote it up as why it might be good to practice pro-active log reviews (the employee was caught due to logs showing VPN logins coming in from China which were subsequently thought to be hackers). Unfortunately, this fellow probably did a HUGE disservice to his fellow employees. He has alerted management and now Verizon is probably thinking, “Wait! 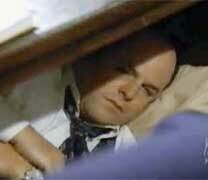 We could outsource this entire department.” Hell, they are probably already in negotiations with the Chinese company. While at face level his idea may seem clever, as soon as you scratch the surface, you realize this guy deserves a Douchebag of the Year award. A crafty developer reportedly figured how to get paid to sit and watch cat videos for a good chunk of the day. It’s a story almost too good to be true — and one which has an almost uncanny resemblance to this fake news story run by The Onion. But according to Verizon’s Security Blog, a U.S. developer actually did find a way to fool everyone at his company into thinking he was working, while in fact outsourcing his entire job to China. Andrew Valentine wrote up the case study for Verizon, and the story apparently caused such a furor it temporarily crashed the Verizon servers. Citing the study, the BBC notes the ingenious scam came to light after the employee’s company asked for an audit to investigate “anomalous activity on its virtual private network (VPN) logs” that pointed to an active VPN connection between Shenyang, China, and the employee’s workstation that appeared to be operational for months. Mid-40’s software developer versed in C, C++, perl, java, Ruby, php, python, etc. Relatively long tenure with the company, family man, inoffensive and quiet. Someone you wouldn’t look at twice in an elevator. Help Net Security reached out to Nick Cavalancia, a vice president at SpectorSoft, to gather information on how companies may work to prevent similar schemes. This entry was posted on Monday, January 14th, 2013 at 2:46 pm and is filed under Editorial. You can follow any responses to this entry through the RSS 2.0 feed. You can skip to the end and leave a response. Pinging is currently not allowed. Wow. Java and Oracle really getting beat up lately. Java seems to be following the downward spiral of Adobe Flash (in terms of viability in being used for web apps/websites). First, Apple sticks a fork in them, and now the government. 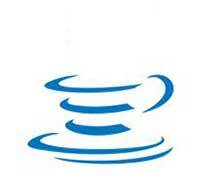 Homeland Security has recommended that users disable Java in their web browsers. Ouch. That hurts. The full story at NBC News. I’ve copied and pasted it below in case the link dies. The U.S. Department of Homeland Security urged computer users to disable Oracle Corp’s Java software, amplifying security experts’ prior warnings to hundreds of millions of consumers and businesses that use it to surf the Web. Oracle declined on Friday to comment on the warning. To make sure Java is really disabled, Wagenseil writes, users can visit this site to check. Java is a computer language that enables programmers to write software utilizing just one set of code that will run on virtually any type of computer, including ones that use Microsoft’s Windows, Apple’s OS X and Linux, an operating system widely employed by corporations. The U.S. government’s warning on Java came after security experts warned on Thursday of the newly discovered flaw. Java is so widely used that the software has become a prime target for hackers. Last year Oracle’s Java surpassed Adobe’s Reader software as the most frequently attacked piece of software, according to security software maker Kaspersky Lab. Java was responsible for 50 percent of all cyber attacks last year in which hackers broke into computers by exploiting software bugs, according Kaspersky. That was followed by Adobe Reader, which was involved in 28 percent of all incidents. Microsoft Windows and Internet Explorer were involved in about 3 percent of incidents, according to the survey. At the time they advised businesses to allow their workers to use Java browser plug-ins only when prompted for permission by trusted programs such as GoToMeeting, a Web-based collaboration tool from Citrix Systems. Java suffered another setback in October when Apple began removing old versions of the software from Internet browsers of Mac computers when its customers installed new versions of its OS X operating system. Apple did not provide a reason for the change and both companies declined to comment at the time. Adam Gowdiak, a researcher with Polish security firm Security Explorations, told Reuters he believes that Oracle fails to properly test its software fixes for security flaws. “It’s definitely safer for users to stay away from Java ’til Oracle starts taking security seriously,” he said. 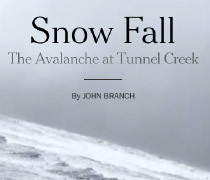 Check out Snow Fall, a New York Times Magazine online article. Great use of HTML5/CSS3/jQuery, and a nice, clean, simple design. Make sure to interact with the photos. And there are several chapters to view (accessible via the top nav and at end of each story). I love how they are translating the magazine app feel onto a website. We’re going to see a lot more of this. Much easier than apps – for both consumer and producer. And better yet, here is the case study – a Q&A with the New York Times team themselves.